Traffic cones are roadside eyesores. But in Japan, there are spiritual ones, depicting the guardian of travelers and children. On Japanese roads, stone Jizo Bosatsu statues are ubiquitous. If you’ve taken a walk in the city or a hike in the countryside, you’ve come across a Jizo statue, often wearing hats or bibs. Few deities are more beloved in Japan than Jizo, a favorite of adults and children alike. 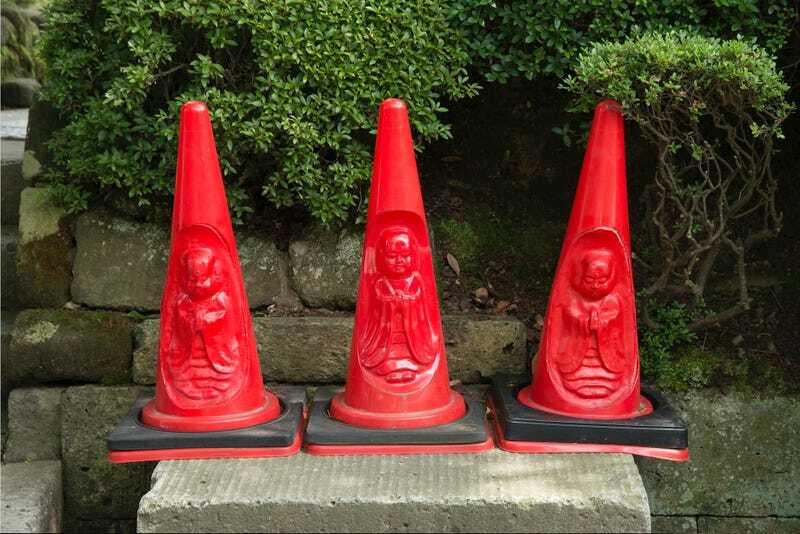 Artist Fusao Hasegawa created the first Jizo traffic cone over ten years ago. Since then, there have been over a hundred of them created and are available in different colors. Considering how common Jizo statue statues are in Japan and their associations, adding the guardian to traffic cones makes perfect sense. Everything About This Game Is So Buddhist!